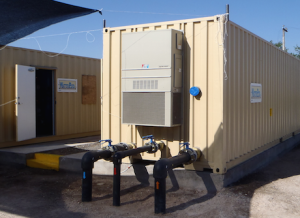 WaterPOD Containerized Treatment Units from AdEdge Water Technologies have been developed to meet the growing U.S. and International demand for small footprint, cost-effective modular water treatment installations. The fully integrated, pre-engineered, pre-wired, packaged water treatment solution combines system performance with economy resulting in an ideal solution for sites where space, cost, and schedule are critical. WaterPOD modular enclosures contain one of AdEdge’s many types ofPackaged Units or APUs treating a wide variety of contaminants for drinking water, remediation, or industrial/commercial applications. 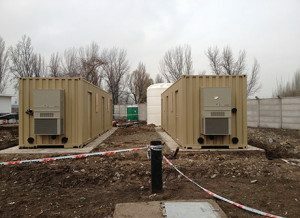 Provided in either 20-foot or 40-foot lengths, the WP-20 or WP-40 units can be single, double or multiple units combined to accommodate design flows of up to 2,000 or more. The treatment systems are designed, custom built and delivered inside the pre-manufactured and customized water tight enclosure. The unit is constructed of painted carbon steel with coated steel overlay on the wooden floor and can include multiple other customizable options including insulation, lighting, ventilation, pedestrian doors, windows, HVAC unit to meet site specific and weather requirements. Pre-designed, pre-piped and integrated treatment system ready for plug and play resulting in a 25 – 50% reduction in installation costs compared to conventional building construction. Reduced engineering time and expense. Minimal on-site work including mechanical and electrical. System inlet/outlet are flanged connections that penetrate the enclosure for simple hookup to the well or water source. Power connections are available in 110V, 22OV single or 460V, 3P per site requirements. Can be placed on a simple foundation or concrete slab base. Can be rapidly deployed to meet aggressive project timelines. Ideal for remote sites where construction or qualified companies may be less available. Short on time to get in compliance? Don’t have much space for a system? Is cost critical? Click here to contact us or fill out a site profile form and we’ll design WaterPOD treatment solution for you today.